Todd curated a variety of open resources to build these courses. The English learning content came from BBC’s Big City Small World,Voice of America’s Learning English and grammar material through Purdue University’s OWL reference site. For the Spanish lessons, he drew from Practica Español, a joint venture of Instituto Cervantes, EFE and Fundación de la Lengue Española. Other lessons came from Professor Barbara Kuczun Nelson’s “Spanish Language and Culture” site at Colby College. COERLL’s “Spanish Proficiency Exercises” and Bowdoin College’s “Spanish Grammar” site provide additional references and exercises. Todd will be presenting these MOOCs at the 2013 New Media Consortium‘s summer conference on June 7. Congratulations to Todd for having his project selected as one of six “Big Ideas” for the Emerging Leaders Competition. We thank him for creating this open educational resource for the language learning public and wish him the best of luck! Fernando Rubio checks back in with us after finishing his first year teaching a Spanish MOOC. I ended my previous post inviting you to think about the role of MOOCs and the intersection between teaching and certification. The conversation that has been going on since my last post has been just as polarized as it was before. MOOCs have recently been called a new form of colonialism because they are an attempt to address the demand for higher education by some of the top universities in the U.S. They have also been touted as a disruptive game changer if MOOC providers can create the right recipe that combines free access and credit. Let’s take a look at some offerings from MOOC providers. MOOC2Degree is a result of a number of universities teaming up with online course developers Academic Partnerships. Students receive the first course in an online degree program as a free MOOC in hopes that they will then pay tuition to complete the degree through regular online coursework. This is simply a version of the freemium model that we all know and love. I am writing this blog post as I read the New York Times’ front page story on how San Jose State has “outsourced” to Udacity some of the mentoring for its basic math courses. The article includes this interesting quote from a higher education officer at the Gates Foundation: “2013 is about blending MOOCs into college courses where there is additional support, and students get credit.” This quote gives me the perfect segue into the point that I want to make today. My main concern is still the same it was when I started teaching my MOOC — What can MOOCs teach us about learning and how can they create a more effective learning environment? And perhaps blending MOOCs into regular for credit (either online or face-to-face) courses is the way to take advantage of what the two formats can offer. My next challenge, for Fall ’13, is a blended course on Spanish Applied Linguistics that will combine 50% face-to-face instruction and 50% MOOC. For-credit students will participate in both formats and will hopefully benefit form the opportunity to interact with a large number of students who will be following the free and open MOOC component of the course. I will keep you posted! In the meantime, please send your thoughts on developments in the world of MOOC language learning. Fernando Rubio is Co-director of the University of Utah’s Second Language Teaching and Research Center (L2TReC) and Associate Professor of Spanish Linguistics. His research focuses on the acquisition of Spanish as a second language and on the intersection of language learning and technology. It’s an exciting time. We’re seeing the next phase of open education happening: progress toward accreditation for open online learning. We thought we’d share the latest news in this welcome trend. Academic Partnerships + MOOC2Degree Academic Partnerships, representing online learning for some 40 U.S. universities, is launching the MOOC2Degree program. This online degree option is meant to attract students to full degree programs. Coursera + UCB, UCI, Duke & U of Penn Coursera and four top universities are piloting a system of awarding university credit equivalency for its online courses. Udacity + San Jose State MOOCs purveyor Udacity partnered with San Jose State University to offer academic credit for a few of its courses. EdX + Stanford Standford has teamed up with EdX in the effort to open up its online courses to a wider audience. It’s not clear what sort of credit learners receive, but courses are taught by Stanford professors (via interactive video) and include formative and summative assessments. MOOCs + Georgia State The university is working on granting credit for MOOCs coursework from other institutions. COERLL + LARC Right here on the language learning home front, COERLL is collaborating with sister language resource center LARC at San Diego State University to develop a badge system for professional development based on an open platform. In the works is a curriculum for COERLL’s Spanish Proficiency Training and Foreign Language Teaching Methods, both open educational resources. What are you thoughts on awarding credit for open online learning? What should we be aware of as we go forward? For example, credited courses are rarely free — Coursera users can expect to pay up to $200 for credit, for instance. But what is this compared to university tuitions? To read more on the topic, see Why I Love and Hate My Spanish MOOC by Fernando Rubio. From the editor: We had the opportunity to interview Scott Rapp, co-founder of the Instreamia language learning platform and the designer and instructor of a new first-year Spanish MOOC (4,762 students enrolled). Check back with Open Up to find out about Scott’s new Language Teaching MOOC for creating blended learning environments. OU: How did you learn Spanish and what motivated you to create Instreamia? SR: My brother, Ryan, and I each spent two years abroad volunteering, Ryan went to Japan, and I went to Honduras. Learning Japanese and Spanish was a necessity. Years later we were both working for Deloitte–Ryan in Japan and I in DC. We began discussing our strategies for learning languages, which was especially on Ryan’s mind as he had to do everything in Japanese, and he was also constantly being asked how he learned Japanese and recommendations for how they could learn English. We decided that a well-indexed set of reference tools combined with natural language processing really took a lot of the tediousness out of learning a language. We gradually worked on building a product around RSS feeds and text-based sources when the “big idea” hit me like a ton of bricks: What if we could go beyond text-only sources, and focus our strategy on subtitled videos? Then we could integrate our powerful toolset into a video player! This led to other breakthrough innovations, like the dynamic exercises and adaptive learning with time-series depreciation that Instreamia includes today. Originally called StudyStream, the Rapp brothers renamed their resource to Instreamia before rolling out their Spanish MOOC in January 2013. OU: Why did you decide to make your courses open? SR: Developing the Instreamia software, we wanted it to have a positive impact on the most people possible. We also recognized that many of the ideas for improvements and future developments would come from language learners and teachers, and that has proven true time and again. We still feel strongly that content development efforts by educators (including ourselves) are best made in Open Educational Resources. Our platform can’t work without excellent content, and obtaining and maintaining licensing for hundreds of videos, learning modules, dictionaries, and explanations would greatly undermine the scalability and versatility of our platform. SR: All the investment in Instreamia has been founders’ capital. Before quitting Deloitte, Ryan put away a substantial seed investment that he was able to live on for over a year while he began the development of Instreamia. I still work full-time, and work on Instreamia and the SpanishMOOC in my free time, and invest a portion of my salary to Instreamia. We knew the time would come for us to change from an entirely free platform to having paid services or premium features. We want to stay true to our decision of making all the content free and open, and we will continue to publish all the materials we or any users create through Creative Commons. OU: What were the factors behind the decision to charge the fee? SR: During our initial offering of our Spanish MOOC, we realized the level of effort and commitment to our students (especially hand-grading assignments) could not be handled solely by volunteers. We were faced with a difficult decision: we could shut down the Spanish MOOC offering altogether, degrade the experience by excluding any teacher interaction, or … offer an improved course with paid TAs and graders, and charge a registration fee. We decided to add the fee, so we could offer a much improved learning experience. OU: What are aspects of your courses that remain open? Native-Content Subtitled Audio/Videos – These are either user-created (under CC), Instreamia-created (under CC), or they are used with permission from YouTube. Teachers can write text, record audio, and translate the transcript through Instreamia’s Video Editor. Instructional Videos – These are videos we make available on our YouTube Channel (under CC). Any teacher can contribute by creating their own YouTube channel and embedding their videos on the Instreamia Lesson Creator. Lessons – These are either user-created (under CC), or Instreamia-created (under CC). Teachers can write text, embed Instructional Videos, and create exercises based on the Native-Content library. Grammar Explanations – These are lessons with special indexing, so that teachers and graders can direct their students to them. For example, typing @gustar anywhere in a lesson or comment would create a link to the Gustar grammar explanation. Dictionary Entries – Every word has audio pronunciation (Forvo, not CC), definitions (Princeton’s WordNet, free license), and multilingual relations, or translations (Instreamia, CC). When a user notices a word with an inaccurate or missing translation, he/she can edit it, so our users are making our translations better all the time. As a community we can make and maintain content that frees us from using archaic textbooks. (See “Got Textbooks? From This Century?”) Together as a group of educators, we can provide a better learning experience without having to license content. This will make teaching languages more scalable and affordable, and it will allow for rapidly-evolving curricula. OU: Do you have any questions for our readers? SR: We have so much to say and to discuss, and we’d love to hear comments from you! How would your classroom change if a computer were able to assign and grade homework based on each individual student’s needs? Scott Rapp is professor of SpanishMOOC, an open initiative to teach Spanish to large groups of people online. He is also the co-founder of the adaptive language learning platform Instreamia, which enables blended teaching by dynamically creating interactive lessons based on native content. The first steps of innovation are always messy. Think of the cellphone. 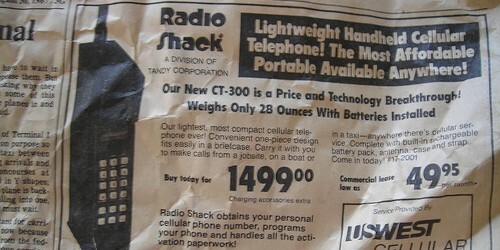 If you are my age you probably remember the first brick phones: large and heavy as bricks and expensive as gold bars. Fast-forward a couple of decades and you find a mini version of those bricks in every pocket. Who would have thought? Now they can decide political campaigns and organize grass roots movements. And most of us only occasionally use them to make phone calls. The number of students currently enrolled in my course is approximately equivalent to the total number I have taught in the previous 10 years. And they come from every corner of the world. Never in my wildest dreams could I have expected to have such a large and diverse audience in this course. This is good. Since all the material is delivered online, the ability to use course analytics will allow me to see how students interact with the course — how they learn. Although I can also do that in a traditional course, the size and format of a MOOC makes the process a lot more accurate and efficient. This is very good. Students who participate in MOOCs are not students in the institutional sense of the word. They don’t have the motivation of a grade or a degree, or the sense of urgency that comes from having paid for a course. They come in at any point, use what they want and ignore what they don’t. This makes it very difficult to design and run a course (particularly a language course). We are used to dealing with teaching that results in learning and certification; a MOOC is a form of teaching that only results in learning (at least for now). This is a challenge. I plan to come back to Open up regularly to give you all updates on how things are proceeding. In the meantime, it would be useful to think about the role of MOOCs and the intersection between teaching and certification. Here’s an insightful blog post on the topic by Cathy Davidson (Hastac.org): What Can MOOCs Teach Us About Learning? MOOCs Revolution Hits the Universities? I can see a day soon where you’ll create your own college degree by taking the best online courses from the best professors from around the world — some computing from Stanford, some entrepreneurship from Wharton, some ethics from Brandeis, some literature from Edinburgh — paying only the nominal fee for the certificates of completion. It will change teaching, learning and the pathway to employment. Therefore, according to Friedman, one of the consequences of MOOCs is the further concentration of power in elite institutions such as Stanford, Wharton, Brandeis, and Edinburgh. So much for democratizing global education! If MOOCs succeed in the way that Friedman envisions, it is likely to mean the end of academia as a viable career path for most people. If a handful of the most elite universities can successfully teach billions, then what need is there for the thousands of ordinary universities out there that currently employ the bulk of faculty. At most, there would be a need for an army of poorly paid graders and on-line discussion facilitators (to respond to the thousands of comments the professor will never read). … Teaching has so far been a craft, and now it is entering the era of mass production. Revolutions are nothing if not unpredictable. They unleash all kinds of unintended consequences. And MOOCs are grand educational experiments. We must admit that no one knows what the outcome will be. So, let’s avoid hyperbolic predictions. They scare people. At first glance, a survey of the most popular MOOCs seems to offer little to those in the foreign languages. The format most closely resembles a large university lecture course and seems to be a poor fit for language courses, which ideally are small to allow maximum production and feedback from the instructor as well as personal interaction with peers in the target language. However, you might not realize the original MOOC, now often called a cMOOC, created by George Siemens and Stephen Downes focused on having students create their own learning networks of practice and reflection. As a result, the format of a cMOOC included a web of rss feeds from blogs, link aggregators, and Twitter created and consumed by the instructors and learners. Instead of looking at what’s missing, let’s think of the possibilities. 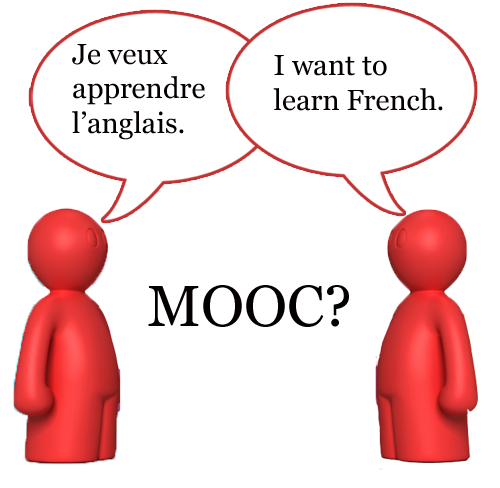 What if language learning MOOCs offered ways to foster online learning networks? Think of the advantages in connecting language learners with native speakers for mutual exchanges. Language exchanges are well established in our discipline, and by combining these exchanges with the content and structure of a traditional course, we can provide our students with a richer experience. And informal learners familiar with learning networks but who don’t have access to traditional coursework could receive structured language education. This is the goal for The Mixxer, a website I created for connecting language learners and teachers for exchanges via Skype. This semester I plan to add to the networking site two short MOOCs — English as a foreign language and Spanish. I’m working on creating lessons to address the core skills using open educational resources from COERLL, Connexions, and BBC Languages. The lessons will include activities for learners to complete with their language partners that build upon the content. The Mixxer already has functions for learners to connect with a language partner, but to further facilitate this I’m adding regular open events whereby native English and Spanish speakers who signed up for either course will be matched and connected to each other via Skype. I am just starting on the lessons and am anxious for links to more open content, preferably like those from COERLL that have a structured sequence of content and exercises. If you know any other open resources or have ideas for EFL or Spanish lessons, I’d very much appreciate a comment below. Todd Bryant (@MixxerSite or @bryantt) is the liaison to the foreign language departments for the Academic Technology group at Dickinson College and an adjunct instructor of German. Todd created The Mixxer to help connect language students with native speakers. His interests include the immersive effect of games in service of foreign language learning, such as the use of World of Warcraft to teach German. One of the speakers at the symposium was Daphne Koller, Professor of Computer Science at Stanford University and co-founder of Coursera, a company that designs MOOCs for the global public. Daphne Koller on Ted Talk: What We’re Learning From Online Education. Daphne spoke about Coursera’s strategy of partnering with top universities to make education freely accessible. The goal is to reach millions of students worldwide by designing effective MOOCs in a range of disciplines. While Daphne presented a compelling vision, several educators raised concerns. It was clear from Daphne’s response that she had thought deeply about the linguistic challenges of MOOCs. She pointed out that while most of Coursera’s MOOCs are indeed in English, students often form study groups in their native languages. And some students actually form groups to discuss the material in foreign languages! In other words, students are practicing foreign languages within the boundaries of an English language MOOC. Daphne went on to say that Coursera is actively seeking courses in other languages besides English. 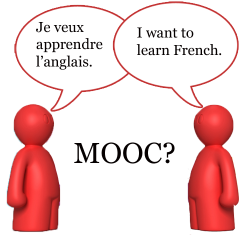 The bottom line is that MOOCs need foreign language specialists. Open online education is a great opportunity for the foreign language community. We understand the difficulties of educating students across cultural and linguistic boundaries, and we have been on the forefront of active, collaborative learning for decades. So, let’s seize this incredible opportunity. Our community’s expertise can truly change global education. So, here is my question: How can we get foreign language educators more involved in MOOCs and in open education? 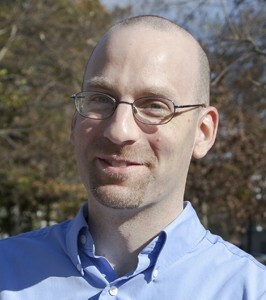 Carl Blyth is Director of COERLL and Associate Professor of French, UT Austin.